The purpose of Lab 6 was to give an introduction into building, manipulating and displaying Digital Elevation Models (DEMs), with the end goal of establishing proficiency when it comes to working with DEM datasets. To accomplish these goals, the lab gives a background into acquiring DEM data for different data sources, creating raster sets from multiple data types and editing those rasters. Working with multiple DEMs gave me an understanding of the advantages and disadvantages that come at different resolutions. This lab was insightful and informative, providing solid information, but a large part of it was a cartographic exercise relative to analysis, an outcome which frustrated me. This project (Note: a fictional project) was undertaken to help the Cottonwood Canyons Foundation with identifying areas of advocacy and public outreach. Big Cottonwood Canyon is one of several watersheds that feed into the SLC area, a map of them can be seen on Salt Lake City's Protected Watersheds page. 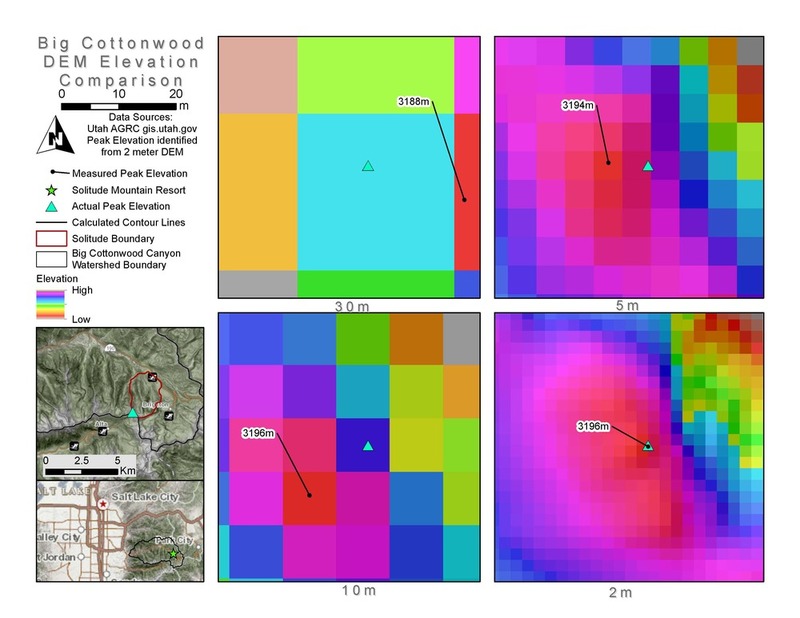 Map shows comparison of the 4 DEM datasets that were compared for use in Big Cottonwood Canyon. The coarseness of the 30 meter DEM is apparent even at the water shed scale. For watershed scale analysis, I would recommend the using the 10 meter DEM. The 2 meter could be used depending on the level of analysis and computational power. A 2 meter DEM may provide more accurate information, but it is a substantially large set of files. The 5 meter dataset looks to have false precision based upon a visual inspection of the image. Though I preferred the 10 meter DEM at the watershed scale, it may not be the same preference at a finer scale. For assess each DEM set at a closer in resolution, I looked at each DEM in the area of Solitude Mountain Resort. The fineness of the 2 meter really shows up here in the close in map. Roads and a minor topographical changes can be easily seen. The 5 meter DEM still suffers from false precision and the 30 meter is too coarse to be useful. The 10 meter DEM, while blurry, may be more useful, since its resolution excludes roads and other man-made structures. The decision between the 2 and 10 meter sets comes down to complexity of analyses, computational power and time pressures. If none of those issues are major pressures, then the 2 meter data may be the superior choice. While I prefer the 10 meter DEM data for analysis, it may not be the most accurate data set relative to other data types. When you compare the contours extracted from DEMs to a USGS 7.5" topographic map, values for the two data types diverge. The 10 meter contours reflect the topo map most accurately, an expected outcome since both data types come from the same source data. The 5 meter contours appear to suffer from false accuracy due to anomalies in the DEM. Compared to the topo map, 2 meter data may be reflecting the "true slope" to a higher degree. If minor changes in slope are of the highest importance, 2 meter data may be the direction to go in. If comparison to older, national USGS topographic maps is important then the 10 meter DEM will better reflect national data sets. One other issue to be aware in using DEMs of different resolution is how each set records and stores elevation. DEMs of larger resolution have a single elevation value per cell and when the cell covers a peak, a value other than the peak is often recorded. An example of this phenomenon is shown below. The 2 and 10 meter sites report the same peak elevation, but the peak elevation for 10 meters is between 10-20 meters from the actual peak. In this situation the 5 meter data is pretty accurate, with a peak elevation 2 meters different from actual and a distance 5-10 meters from the actual peak. The unsuitability of the 30 meter data is further confirmed since it is neither accurate with location (20-50 meters off) and elevation (8 meters from actual peak elevation). Overall, after looking at all the available DEMs and assessing their usefulness, I would recommend that the 10 meter DEM be used. I feel that it accurately reflects the actual land surface, providing a balance between proper representation of the watershed and file size.